The latest hot-button subject in tech, hotter even than ephemeral apps, is diversity. Or at least, if not actual diversity, the act of releasing employee diversity statistics. From Apple to Twitter, almost all the big names in Silicon Valley are doing it. Google fell first in May, and with some pushing by activist organizations the rest soon followed suit. 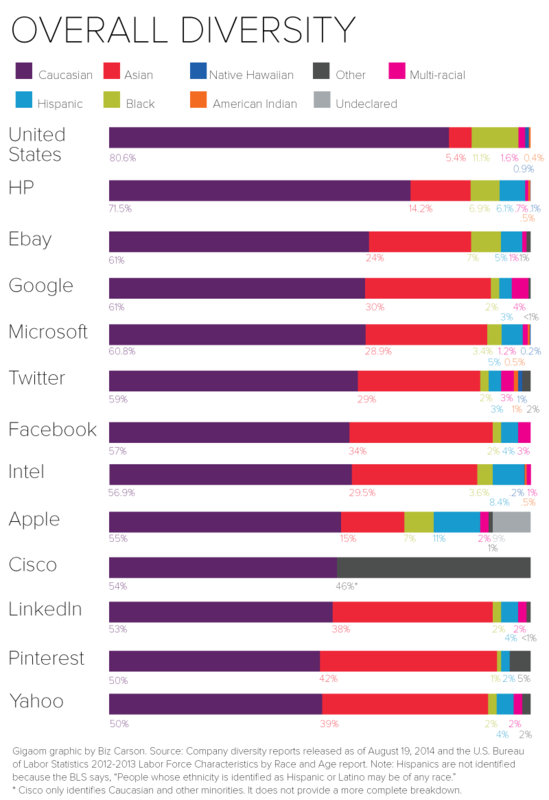 We’ve broken down some of the top players – [company]Apple[/company], [company]Twitter[/company], [company]Pinterest[/company], [company]Facebook[/company], [company]Google[/company], [company]Yahoo[/company], [company]Microsoft[/company], [company]eBay[/company], [company]LinkedIn[/company], [company]Cisco[/company], [company]Intel[/company], and [company]HP[/company] – comparing their overall gender and ethnicity demographics. Then we went a step further to look specifically at the tech and leadership roles. Where relevant, we also charted the demographic information of the U.S. labor force and the graduating computer science class. Please note that the numbers in the company charts come from a range of sources — federal EEO-1 data, company blog posts, and annual corporate reports. In some cases, particularly diversity in leadership roles, the companies have slight differences in how they collect and categorize their demographic data (For example: counting a global workforce versus just U.S. based). In other words, it’s not entirely parallel information. But our charts represent the best comparisons we could draw among the companies. When appropriate, we explained the differences in the footnotes. 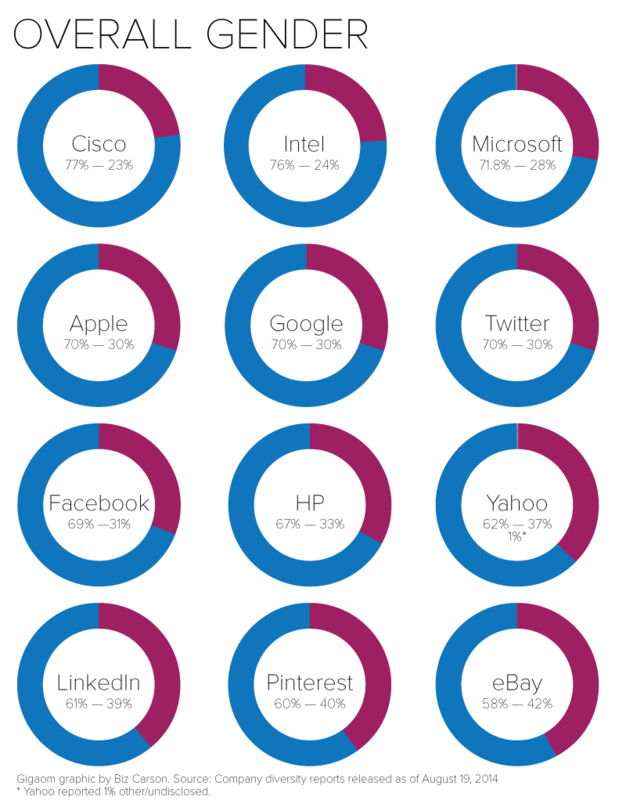 Based on our research, [company]Amazon[/company], [company]Oracle[/company], and [company]IBM[/company] appear to be the last big tech company holdouts for releasing staff demographics. None of them responded to our requests for comment. Unlike their peers at Twitter and Facebook, these holdouts haven’t had as much pressure placed on them to release their numbers. It looks like the public is far more interested in the companies that capture the most consumer attention; the unsexy, bigger, older corporations are left alone to their own devices. We spoke with Pinterest engineer Tracy Chou, who some credit as being the first to get the ball rolling on this issue when she published a blog post last October asking “Where are the numbers?” She said that although she’s excited at the transparency shifts, the true work will come in a year’s time. “It’s ironic when you look at how consumer web companies build their products: You always measure everything in your funnel, you try out new strategies for growth and you measure the metrics. But we weren’t doing any of that with workplace data,” Chou said. Chou believes there needs to be a “state of the union” every year, where companies release their new staff demographic data. That way, the companies can track which initiatives they’ve implemented to promote diversity are working. And the public can hold them accountable for not just saying they care about staff diversity, but actually doing it. Part of the problem tech companies face in staffing people of diverse ethnicities and gender is that there aren’t enough women or minorities coming down the pipeline from computer science programs. As a base line of comparison, consider the American computer science graduate data for gender: Sure enough, only 14.5 percent of the people graduating with bachelor’s degrees in CS are women. 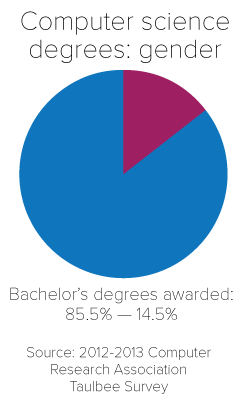 The tech companies are pretty much on par with the graduates. 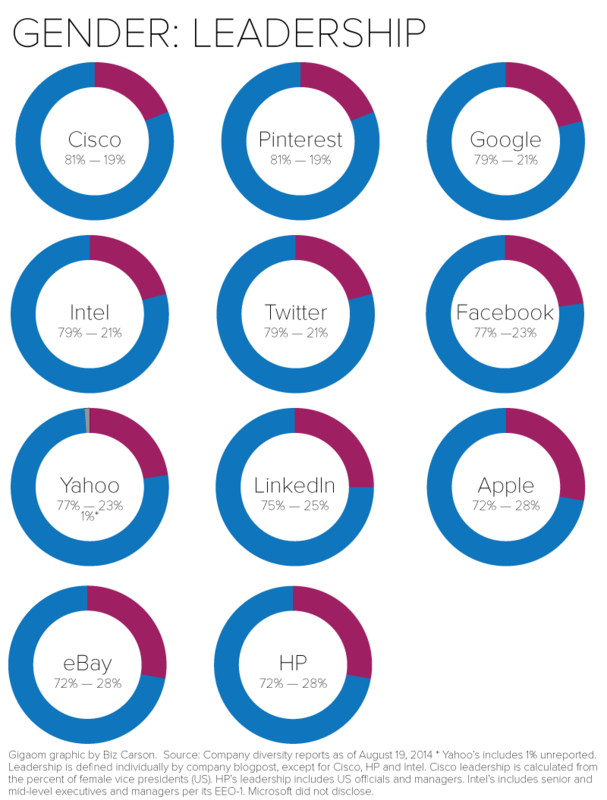 Data sources: Apple, Cisco, eBay, Facebook, Google, HP, LinkedIn, Pinterest, Twitter and Yahoo. But why must I accept the notion that the workforce demographics of any particular company or even industry must necessarily mirror precisely the population demographics of humanity as a whole? What scientific research is there, that suggests that such a precise microcosmic mirroring would be the expected outcome of any hiring effort? What scientific research is there, to suggest that the absence of this mirroring is evidence of some sort of intentional or unintentional skewing effort? Very interesting perspective! Iâ€™d love to read this. Why do people writing these types of articles assume the only source for candidates are New Graduates? There are swaths of women with extensive backgrounds in Tech who have been driven out of the marketplace for the simple and blatant reason that NO ONE WOULD HIRE THEM, regardless of how skilled and qualified they were. In many cases, they’ve been forced (mostly by recruiters, IMHO) in to other “tech-ish” but still non-tech roles, such as Project Manager or Business Analyst, because they “know how to talk to users”. That is, if they haven’t simply given up and gone into retail instead (a 30+ year kernel/embedded C programmer I know went this route – just one of 4 or 5 examples I could give, and all of whom would so much rather be writing code today). You want more women in Tech? Start looking around at the ones you already know. Trust me, it will be much faster (and easier) to help them get up to speed on whatever language-of-the-week is de rigueur than to wait for an ever-declining-pool of future female candidates to graduate. the only issue I have with the article when dealing with racial differences, the companies appear to reflect the demographic of the United States. It is like going to India and complaining that most of the workers are Indian and why are there not more white workers here. You have a high count of white people, thus you have a high count of white employees. Why is this an issue. The first lessons I took away from the stats class I took in college was that they visually lie. Information may be displayed accurately, but how they are represented and spun changes everything. Hi Nathan, We tried to include the comparisons to overall US workforce statistics, computer science graduate genders and computer science graduate’s racial diversity. The point of the article and its matching headline was to put the charts in perspective, so hopefully by showing the charts with some level of baseline comparison people can form their own judgements. Tech is one of the few sectors in which American made products are still globally dominant. May be others should learn from it, instead of trying to change it. Making money is actually the first and foremost objective of businesses. Being representative of ethnic/gender population statistics is not an objective in itself, its a constraint society enforces on businesses, just like paying taxes or not dumping toxic waste. The most efficient way of promoting ethnical/gender diversity at work would be to demonstrate that it has financial benefits. If there is a correlation between diversity and revenues, businesses will act upon it. 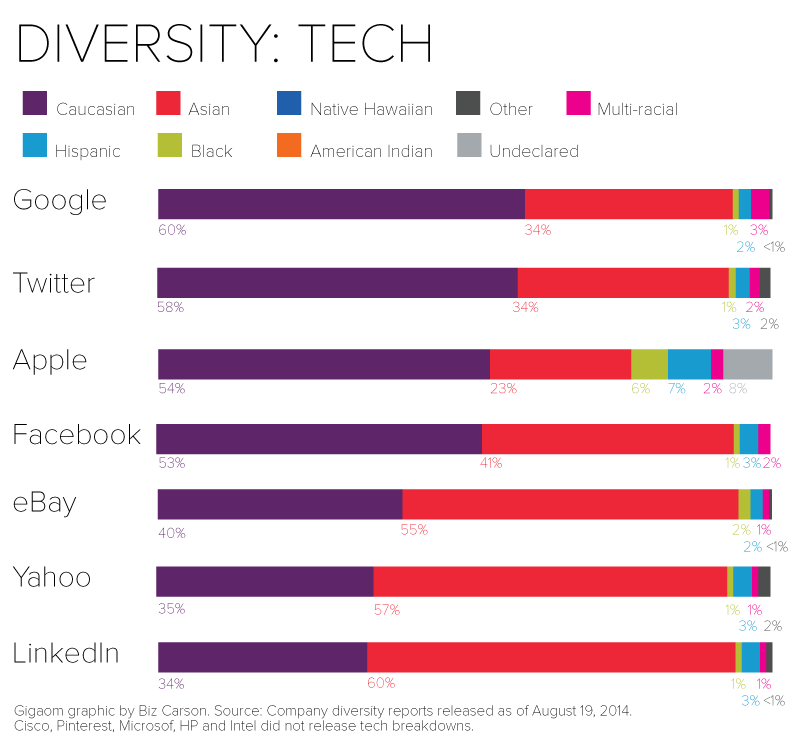 Adding graphs of results of the companies to the graphs of diversity would be a simple task. How about a baseline comparison of how many people graduate from STEM majors as a function of gender and diversity? You can only have that many people coming out as many enter the pipeline. You say “Cisco and Intel lead the pack with the worst gender diversity”. I am not an expert, but I think these are the most “technological” of the companies listed. I think these two are more likely to have more electrical engineers that eBay or Yahoo. And female electrical engineering graduates are hard to find. So its nice that you provide this data, but without sufficient supporting data about the pool of potential employees its not revealing much. As a starting point, you provide American computer science graduate data for gender. 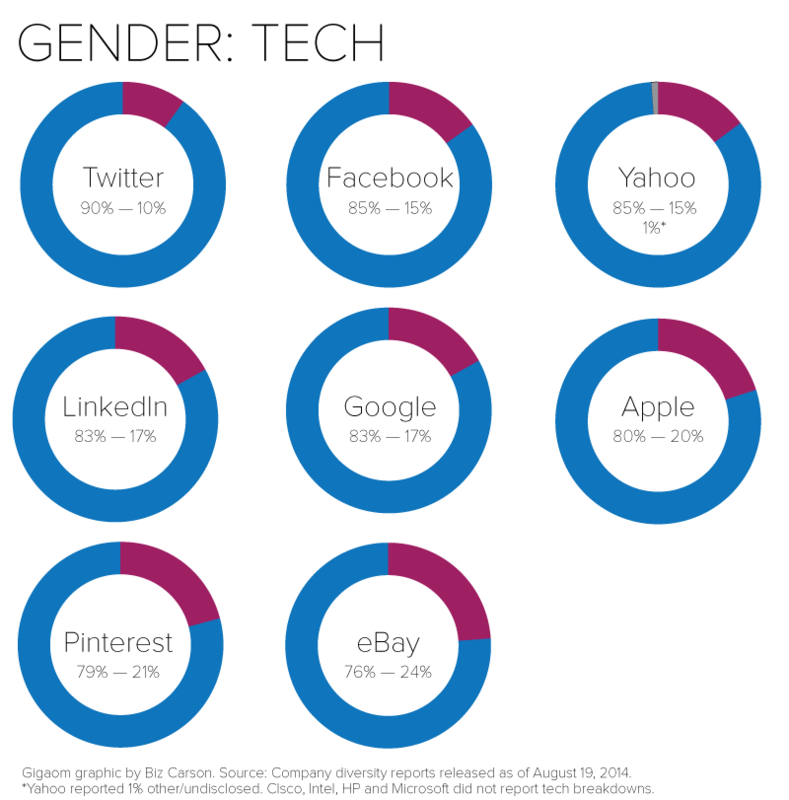 Comparing it with the employment data appears to exclude gender-bias in hiring, so are tech-companies doing a good job? Further, I do not understand your ethnical diversity comment that says “Pinterest is the least diverse by a slim margin, with 92 percent of the company Asian or white”. It sounds as if you’re not considering Asians sufficiently “diverse” to be counted towards ethnical diversity. I agree with the commenter who said you make no case why diversity necessarily matters. Also, you’re not providing a definition of diversity, which is absolutely necessary in view of your above conclusions about Pinterest. All gender and minority should be irrelevant as the best person for the job should be how it works. I have witnessed first hand a job being given to somebody less capable because they had to be seen as diverse. That itself is active discrimination. Excellent data collection and compilation. Most informative writing on related topic. I forgot who said this: “What we don’t measure, we can’t improve.” Thanks for starting the ball rolling on this. Now to spread the analysis to other countries and sustain the scrutiny year over year. I will reference this info. It’s important to keep in mind that women are 50% of the population, but non-Asian minorities are, well, a minority. When reading the chart I kind of had to go back and forth to figure out each minority and whether the numbers were good or bad. It might have been better as some kind of graph where it was easier to compare the numbers in the general population with the numbers in each of the boxes. What’s interesting to me is that none of us need a legend for the gender charts. We intuitively know that the smaller portion (purple) is female and larger (blue) is male. That’s telling in itself! Having been a hiring manager for college interns a number of years ago, how do these numbers match graduation rates from the major university programs in the US? How do the numbers compare for those who entered as college freshman as EE, CS, or CompE? What do high schoolers say the interests are as juniors and seniors? I know that I had a hard time just finding resumes for interviews from diverse candidates. We need to dig deeper as to why the numbers haven’t hit a more equitable ratio that people are looking for. I think you might find this report of interest, it is from the Computing Degree and Enrollment Trends annual survey. It is a break down of the data you mentioned. Every one has the equal right to pursue the opportunity, but the outcome will not be equal based on their ability and skill. Some people want to see 12% of NBA players are black, 12% of tennis players are black, 12% of golf players are black. That’s not diversity. That’s called uniform quota. This kind of uniformity has been successfully achieved in North Korean where every person gets the same thing. In America, every one uses their strength in either sports, music, science or technology. That’s true diversity. Two things are just not made clear to me. First, what are the races and genders or the original founders of these companies? That might be of interest as it may show bias in access to financial resources. Secondly, the race data seems skewed. Using our president as an example, he is actually of mixed race although he would probably be termed black. Does any amount of genetic diversity allow one to chose one’s race? Obviously this soft classifying will throw what should be hard data in a skewed direction, it seems to me. Why point the finger at tech companies? I’d wager that professional employment at universities & colleges, hospitals, Wall St firms, and VC firms mirror similar demographics. @jadefa “cultures of irresponsibility and laziness…” Wow so you buy into those stereotypes, and forget how nepotism and all other “social engineering” assist with what you are describing as some meritocracy, please. Then you use the example of sports, and made a reverse racist remark about what NBA and NFL would look like with this type of social engineering. Yet, you have no clue to history and how bigotry precluded minorities participating in sports, and until someone actually allowed blacks to play the game, where all the stereotypes you buy into begin to break down. The same is true in tech. Black and other minorities have had tremendous impact on health and sciences, and unless given the opportunity, will never be able to shed the stereotype of being lazy and irresponsible. Totally un-american, quite the contrary, in that America is made up of a land of immigrants, no one whose born here, can exclusively trace their roots back to America. We come from England, Africa, Ireland etc. America is about opportunity for all, and allowing anyone the opportunity to succeed. What is going on in tech, the lack of diversity is Un-American. How about those diversity stat’s for the NBA? How about stat’s for stay-at-home mom’s who can’t get into that diverse workforce after raising our children? How about we all just hire the best qualified person whether they are men, women, any color, any religion, from any walks of life as long as they are the most qualified to do the job well? Huh, what a concept that would be! A shameful exercise. First off, you make no case for why diversity necessarily matters (outside of lefTist academic circles). Secondly, you ignore the only diversity that matters: diversity of thought. I presume gender and race are thought to be proxies for diversity of thought, but that presumption is racist or sexist, is it not? Would love to see the diversity by age group. These companies have a collective reputation for pronounced age bias, but it’s never covered in media, although it’s information that really needs to be clarified and known. Sohandsome — A lot of these companies don’t disclose age of their employees. I think it was only Microsoft that had an age breakdown. I agree though that it would be interesting to analyze if we could get our hands on it! Totally agree. Ageism is a very scary trend in tech today unfortunately. Well, then you would have to separate managers and techies (it’s easy to find a lot senior manager, but there are not so many web-developpers older than 45), plus disclosing the stats for appliances, by gender and age. Very useful way to view this. I will tweet and email. One curiosity: It looks like FB and HP have zero (or nearly) in ‘other’ or ‘undeclared’. Makes me question their report. I’m writing an essay about gender. And I guess I will concentrate on IT and women in this field. Thanks for the idea, and for info too, of course.